Here's a little tutorial I actually put together last year--but I really did not even get these made and sent out until after the holidays (yes, I admit I am sort of notorious for belated gift-giving--I like to tell myself it is a positive thing because it is a nice surprise to get a little something unexpected after the initial glut of gift-giving) so I ended up saving this project for you for this year. As you may have noticed by the number of breakfast-y recipes I share around here, I love breakfast. Especially weekend breakfasts when I have time to make a little something especially warm and tasty. I think weekend breakfasts are like a celebration of the start of the day and all the possibilities that lay before you. I also think it is one of the most comforting meals and is as close to being love in your tummy as anything else you can eat. So, I put this together as a way to share the love with family and friends. Last year was actually the second time I made this as a gift--the first was several years ago for our friends, and then last year we gave this to some of our family members. It is a box of nourishing, home-prepared and cooked ingredients that help to fill you up for the day ahead--like a hearty vanilla almond granola, an oatmeal pancake mix, and another mix for a whole-grain Irish Brown Bread (first discovered and fell in love with while I was living in Galway, Ireland many years ago). This is food that feels good to eat after all the sweets and excess of the holidays. A friend we gave this to a few years ago told me that she really appreciated the fact that we included the recipes--she described it as us not only giving them fish, but teaching them how to fish. That made me smile. And she and her family still make the granola for themselves to this day. I also love that this is very customizable as a gift. The first year we hand-delivered this to friends in the city, so we also included a frozen log of ground homemade breakfast sausage, as well as a bottle of real maple syrup produced locally. I think we also actually baked the Irish Brown Bread and gave loaves as a opposed to a mix. 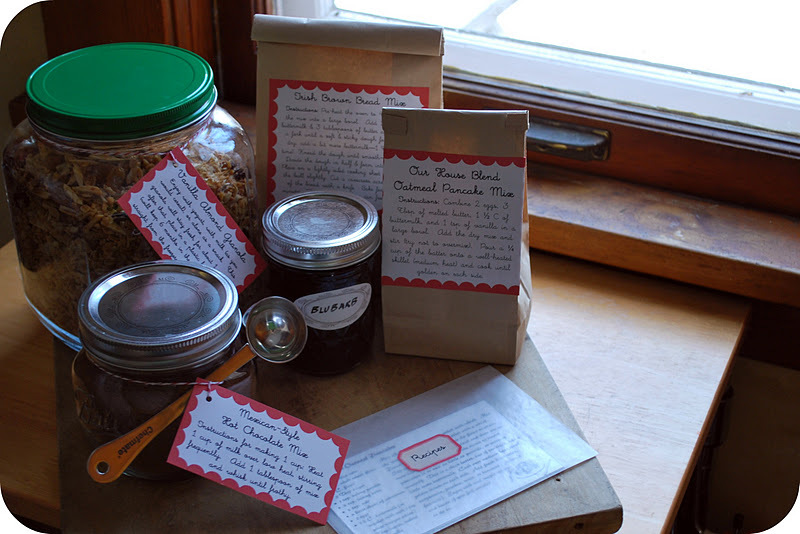 Last year though, we included a jar or two of our homemade jam canned earlier in the summer. 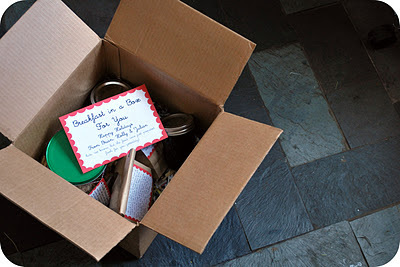 But you could include a bag of your favorite coffee or tea blend, tuck in a jar of marmalade (which is delicious with the Irish brown bread, by the way), a block of some European style butter...put your thinking caps on and make it representative of the kinds of breakfasts you and your family love. As for this tutorial, included are all the instructions on how to prepare the foods and package them, printable templates for the labels and other packaging, copies of the recipes, and links to some sources for the jars, lined food bags, etc. 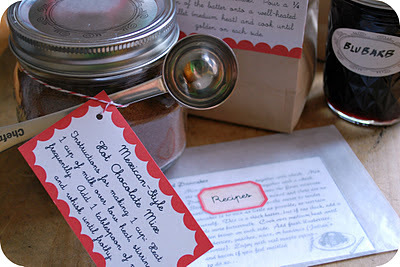 This is a great holiday gift project for "assembly-line" giving--meaning, you make multiples of the same thing to give. I often take this approach to gift-giving with our friends and family. To me, it is an easier way to give a little something handmade from your home without the chaos of making too many different things. Blackstrao granola? I am intrigued...would love to try to that! What a great idea! I can't wait to try these recipes. I am so with you on one handmade gift that works for lots of recipients. this is fantastic - such a great gift for anyone! 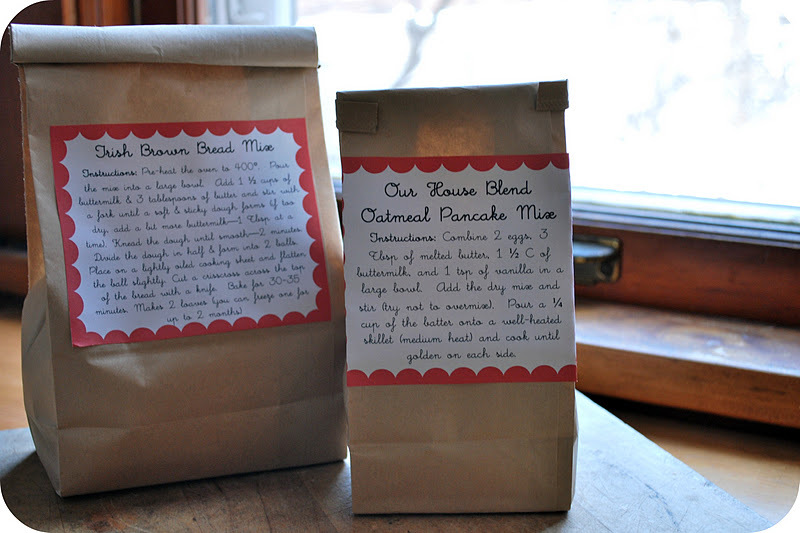 We made these today and found a few discrepancies between the recipe cards and the double batch instructions. Particularly in the oatmeal pancakes where there are 5 ingredients with discrepancies. The granola recipe card does not list cinnamon and the Mexican Hot Chocolate doubling instructions does not include ground cloves. The Irish Soda bread recipe card does not list wheat germ and there is a discrepancy between the card and the doubling instruction regarding the amount of oat bran. I wish I would have looked at this before I made the pancake batch, but I guess we'll just try the mix out tomorrow and see what happens. Which version do you use? Sugabeets, There are a couple of errors. IN the pancake recipe--to make the mix you use 2 tsp baking powder, 1 tsp baking soda, 1 tsp salt, 4 Tbsp sugar--the rest is as it should be. 1 1/2 cups of oats is correct for the mix too. As for the cloves in the hot chocolate--you can make it either with or without--either is good. I chose to make my mix without. 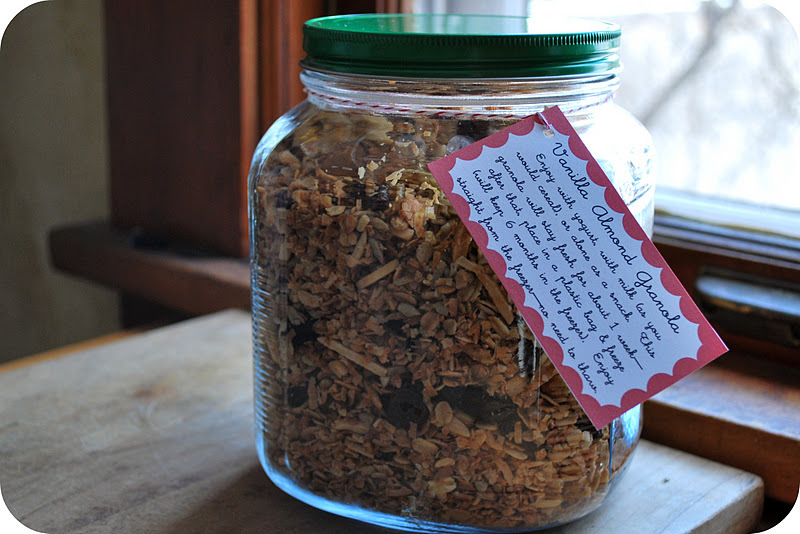 Same with the cinnamon in the granola. But, there should be wheat germ in the Irish bread. 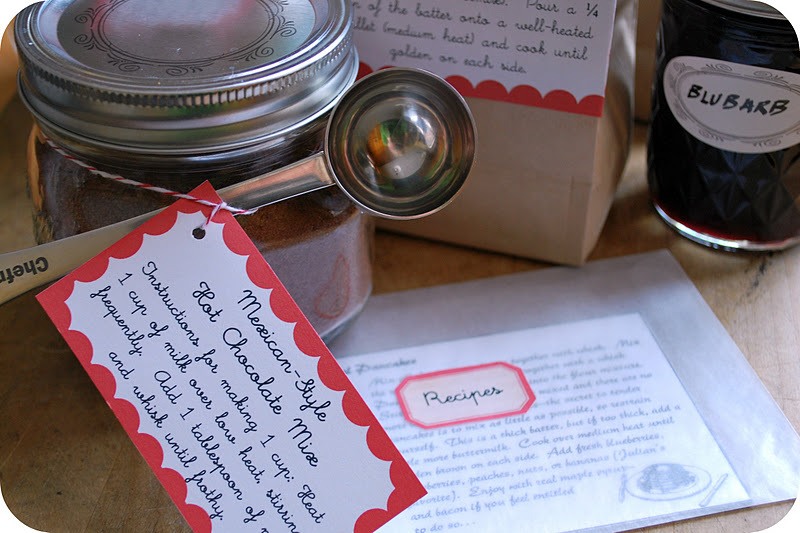 You see, I made my recipe cards a couple of years ago and I sometimes change up how I prefer to make something--but obviosuly forgot to synch up the cards. I will fix the recipes in both the cards and in the recipes for the mixes to give. I am very sorry about that but am grateful you told me! Am off to fix it now and reupload the document. By the way, I meant to mention that since you probably have too much baking soda, salt and baking powder and sugar in your recipe--you could just add more of the other ingredients to balance this out--then save the remaining mix for yourself to have around the house for your own use! At least you will not need to throw anything out.